The Ingrid Bergman series is made up of three types of screen prints of the Academy Award winning actress in 1983. The source images used for these portrait pieces include movie still from her role in Casablanca (‘With Hat’), a movie still from the movie The Bell of St. Mary’s (‘The Nun’) and also a publicity photo (‘Herself’). The screen prints are printed on Lenox Museum Board and were done by request of a Swedish art gallery. Ingrid Bergman 314 (The Nun) by Andy Warhol from the Ingrid Bergman series. Andy Warhol’s stunning images of Academy Award winning actress Ingrid Bergman, were created by Warhol at the request of a Swedish art gallery in the 1980’s. Andy Warhol’s Ingrid Bergman portfolio was printed in 1983 by Rupert Jason Smith in New York and published by Galerie Borjeson, Malmo, Sweden. Taken from a still of her 1945 movie “The Bells of St. Mary,” this portrait of Ingrid Bergman in her most severe role is made all the more dramatic in this iconic print from Warhol’s Ingrid Bergman series. 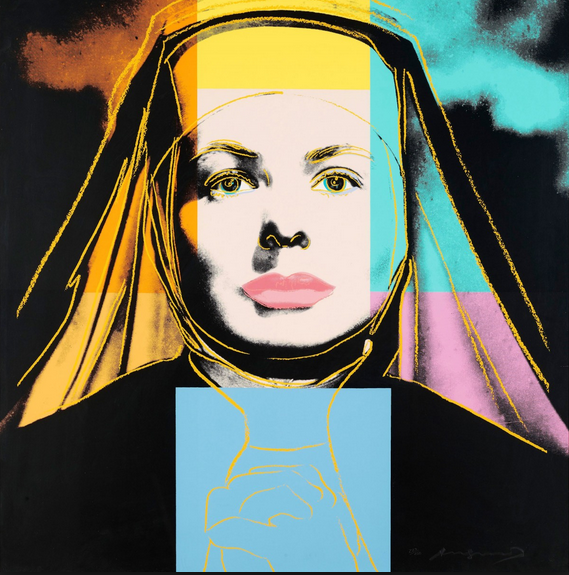 The vibrant color palette in the piece Ingrid Bergman The Num FS II314, is made dynamic through Warhol’s exciting element of abstraction, the yellow lines making her figure and makeup pop, with her hands clasped in prayer. After the the success of the Campbell’s Soup series in the early 1960s, Warhol began creating screenprints of movie star portraits including Marilyn Monroe, Elvis Presley, and Elizabeth Taylor. This print is indicative of Warhol’s obsession with all things relating to fame, especially movie stars. His fascination with pop culture spilled over into his creative output, which is evident by his prints of movie stars, Campbell Soup cans and political figures. His art is a visual recording of the culture of his time. The Ingrid Bergman series is made up of three types of screen prints of the Academy Award winning actress in 1983. The source images used for these portrait pieces include movie still from her role in Casablanca (‘With Hat’), a movie still from the movie The Bell of St. Mary’s (‘The Nun’) and also a publicity photo (‘Herself’).